The season passes for the 2019 racing season are on sale now. A season pass includes one general admission ticket to every race this season excluding the World of Outlaws Sprint Car show on June 4th. Click the "Buy Now" button below to order. 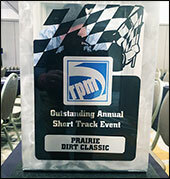 Prairie Dirt Classic Named RPM Outstanding Annual Short Track Event! 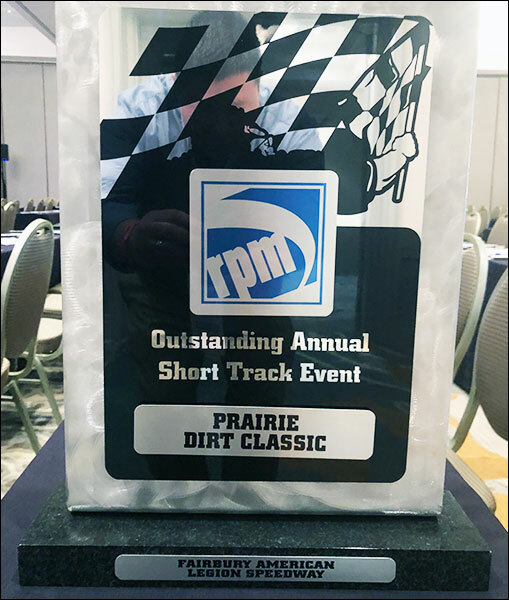 The Fairbury American Legion Speedway and the Prairie Dirt Classic have been awarded the RPM Outstanding Annual Short Track Event at the annual RPM Promoters Workshop in Daytona Beach, Fla. This national award was accepted on behalf of everyone that has ever had anything to do with putting this event together. This year marks the 30th annual running of the PDC. Through the years, hundreds and possibly even thousands of people have helped get this event to where it is today. This prestigious award is because of the help and dedication of each and every one of you. A huge thank you to everyone who has ever been involved in any way, especially those that had the vision 30 years ago to put on this event. Also, a big thank you to every team, driver, fan, and marketing partner that has ever been a part of this event. We could never receive this award without you. 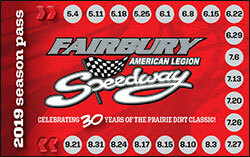 With a new era at Fairbury American Legion Speedway in 2019 comes an exciting new weekly racing program sure to energize fans and racers alike. 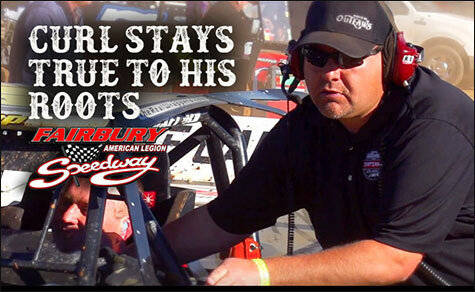 Matt Curl, who will be returning to his hometown track as owner and promoter after spending the 2018 season as the World of Outlaws Craftsman Late Model Series director, announced that the venerable quarter-mile oval’s regular Saturday-night action in ’19 will be highlighted by the FALS Cup Weekly Championship. The special series will feature unprecedented payoffs at all weekly shows for both DIRTcar Late Models ($2,500 to win and $300 to start from a total purse of over $10,000) and UMP Modifieds ($1,500 to win and $175 to start from a purse exceeding $6,000). Overall, more than $22,000 in purses will be distributed at Fairbury’s weekly cards, which will also include the Sportsman, DIRTcar Street Stocks and Hobby Mods in 2019. And despite the increase in payouts, general admission and pit gate prices will stay the same at $10 and $25, respectively, during the upcoming season that kicks off on May 4.